I don't understand the Japanese language or kanji, and this might be related to that. As Chihiro gives her name to Yubaba, she writes 4 symbols in a piece of paper. 3 then fly away and she reads the remaining symbol and calls her Sen.
What was written in those symbols, and why did Chihiro's name turn out as Sen? Answer: The remaining Kanji is what Chihiro's name will become if she was to stay in the spirit world. Her name does not have any meaning per se, but breaking down the Kanji,千 In English Chi or sen, which means 1000 in English. The second Kanji 尋 , tazuneru or hiro means to search or inquire. The reason for this was the longer she was to stay in the land of the dead the more she would forget about the living world, her making a mistake of her name is the first time we see her displaying this. Onto the question about why the Kanji 「千, せん = sen」 remained. Does this mean anything? From a Japanese language point of view, no it doesn't. But, did Miyazaki Hayao want this to mean something, I don't know??? To sum it up, basically Miyazaki Hayao is saying that your name is something that defines you through out your life and as I stated earlier being that Chihiro is now in the spirit world that she starts to forget about the living world. When Yubaba takes those other kanji all that is left is 「千, せん = sen」, this is what Chihiro's name will become in the spirit world if she ends up staying there forever. So she will effectively forgot everything about her life of the living. who she was, her parents and basically everything she ever knew. Hence the reason for the other Kanji disappearing, having a symbolic message that she will lose herself in the spirit world. And I am guesing that is why the movie is named this 「千 と 千尋 の 神隠し」 in Japanese. Emphasis on 「千 と 千尋」. Miyazaki Hayao gives some really deep messages, unfortunately it is not easily translated into something that an English speaker, well whit a short answer like this anyway. 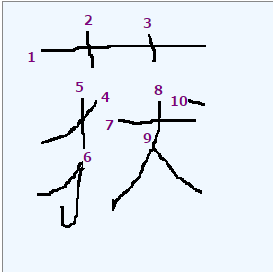 Chinese characters often have several pronunciations in Japanese. The context is important in knowing how to read a Chinese character. The character 千 (meaning "thousand") is pronounced "sen" on its own, but "chi" as part of the name "千尋" Chihiro. Learning how to read kanji in context is one of the challenges of reading Japanese. When a person asks Yubaaba for work she is compelled to offer them a job but controls them by stealing their name. When the Kohaku river was redirected to culverts and sewers, the god of the river, having nowhere else to go, came to Yubaaba and asked to become her apprentice. She stole his full name "Nigihayami Kohaku Nushi", and he became Haku, and subject to her will. She tries to steal Chihiro's name, but fails as Chihiro has the goodbye card from her old school friend. There is a scene, on Sen's first day at work, when she has to turn her name tag over, to show she is present for work. You can see the other names that workers have. Some are single Chinese characters. A tall humanoid woman behind Sen turns over the tag lablled "口" (kuchi) meaning "mouth". She must have also had her full name stolen. On the other hand, "Rin" has her name written phonetically, as "リン". Not the answer you're looking for? Browse other questions tagged plot-explanation spirited-away . How does the movie Spirited Away justify its title? Why aren't all the werewolves turning at the same time? What was the reasoning for turning off the fences? Why did the Great Gasby (2013) movie erase the hints of Nick Carraway's homosexuality? What stops government from turning off the feeds? Was Fritz a Nazi all along?